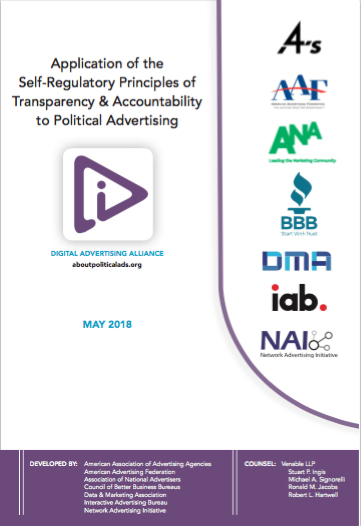 This Application of the Self-Regulatory Principles of Transparency & Accountability to Political Advertising explains how the Digital Advertising Alliance’s (“DAA”) Self-Regulatory Principles of Transparency and Accountability apply to certain online digital political advertising. This guidance responds to the growing use of digital advertising platforms and technologies to reach potential audiences with political advertising and creates new tools to provide greater transparency and accountability to such emerging practices. The guidance explains that a Political Advertiser who pays for the promotion of an Express Advocacy message is responsible for providing enhanced notice in or around that Political Advertisement, which links to a notice disclosing certain information about the Political Advertiser. As described in this guidance, the notice will include information about the person or entity engaged in the Express Advocacy. Over time, it is expected that Political Advertisers will provide enhanced notice via a version of the DAA’s transparency icon, which has become the ubiquitous symbol for consumer transparency in the digital advertising ecosystem.